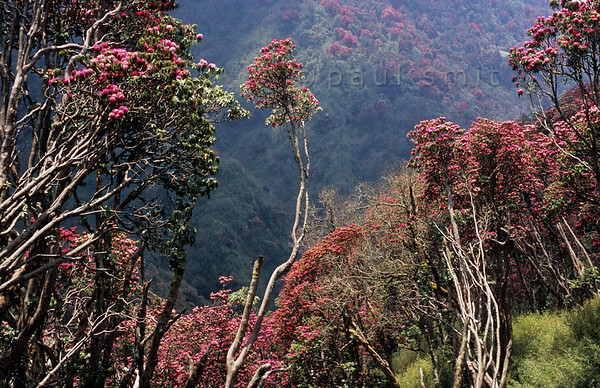 [NEPAL 27110] ‘Flowering rhododendron forest.’ In april the mountain ridge between Ghorepani and Deurali in the Annapurna Conservation Area is covered in flowering rhododendron forests. Photo Paul Smit. 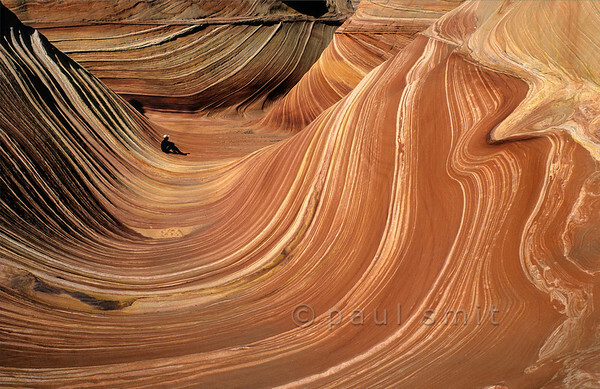 [USA.ARIZONA 27984] ’Hiker in The Wave.’ The hiker who enters "The Wave" in the Coyote Buttes nature reserve (part of the Vermilion Cliffs Wilderness) may think he is stepping into a sticky red fluid with white stripes, something like sour cream stirred into pumpkin soup. But this geological wonder actually consists of 200 million years old fossilized sand dunes. Photo Paul Smit. 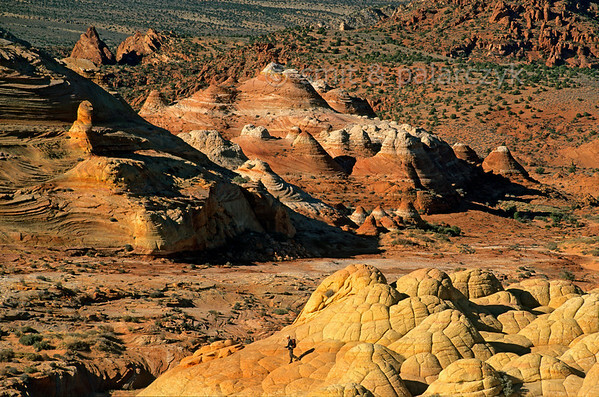 [USA.ARIZONA 28012] ’Coyote Buttes nature reserve.’ The strange landscape of Coyote Buttes nature reserve (in the Vermilion Cliffs Wilderness) is made up by a 200 million years old geological formation called Navajo Sandstone. It is composed primarily of wind-blown sand from a vast ancient desert. Minerals of iron oxide, deposited by groundwater after the accumulation of the sand, have created red, orange and yellow colours. The light dome-like structures in the foreground are locally called "Brains Rocks". Photo Paul Smit & Mick Palarczyk. 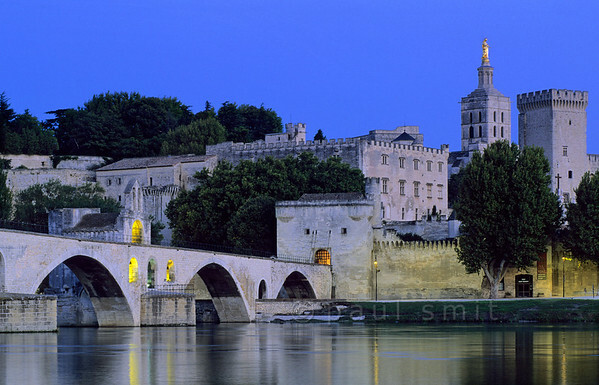 [FRANCE.PROVENCE 10930] ’Sous le Pont d'Avignon.’ Of course the famous song goes like this: "sur le pont . . ." But that doesn't tally with the historical facts. People didn't dance on the bridge but on the bank of the river in the shade of the arches. The nicest view of the famous bridge and the walled town of Avignon with its papal palace can be enjoyed from the opposite bank of the river. To get there you have to use a little ferry because the bridge was partly devoured by the Rhône during a catastrophic flood in 1669. Photo Paul Smit. [FRANCE.VOSGES 9158] 'Magical forest.' The Vosges mountains in the northeast of France are covered with forest. 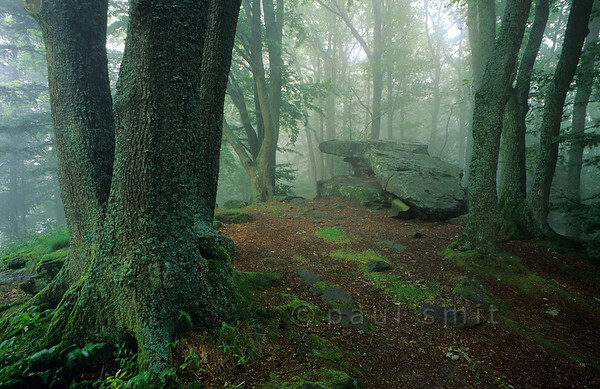 This magical spot, deep in the forest, can be found near Haute Koenigsbourg. Photo Paul Smit. [ITALY.LOMBARDIA 01811] 'Hermitage with a view.' 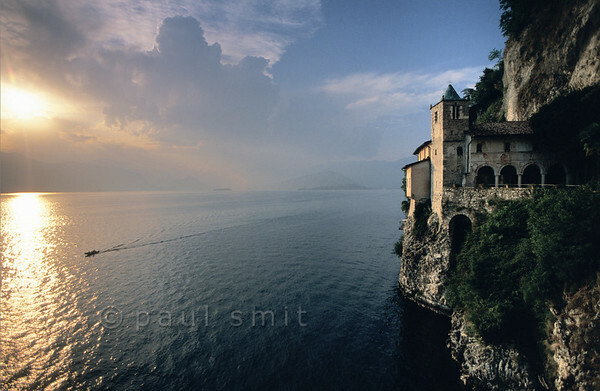 The Santa Caterina hermitage is built on a breathtaking spot halfway up a cliff over Lago Maggiore. Here a hermit once retreated in a cave. He helped people with spiritual advise and medical care. Asking what he wanted in return he said "a chapel." Later a church and small monastery grew from it, still occupied by several lay brothers and sisters plus one friar and open to visitors. Photo Paul Smit. [ITALY.PIEMONTE 01602] 'Stones with a view.' While in high season tourists are trapped in the traffic on the road circling Lago Maggiore, a few hundred meters up you'll find perfect quietness. 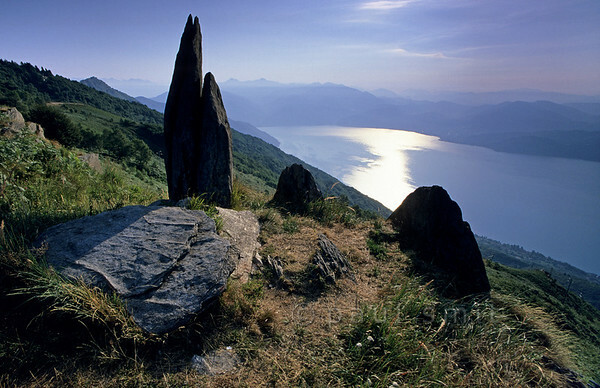 The Alto Verbano, here near Piancavallo, offers the best slopes for a hike. Photo Paul Smit. [SWITZER.MITTEL 00814] 'Rhine waterfall.' 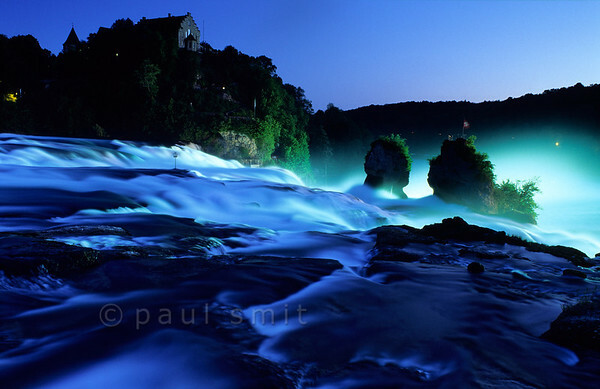 Europe's largest waterfall, the Rheinfall near Schaffhausen in Switzerland, thunders down through the evening light. Photo Paul Smit. 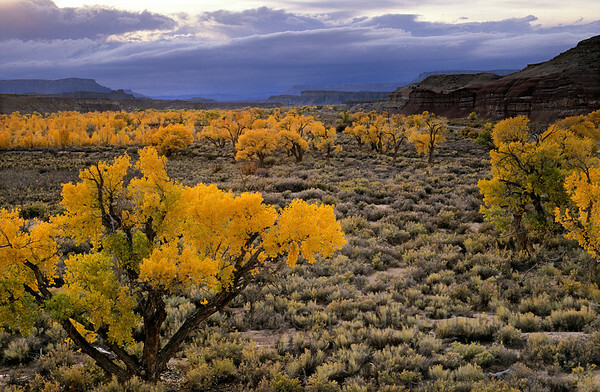 [USA.UTAH 28177] 'Cottonwoods in Fremont valley.’ The yellow autumn colours of Fremont cottonwoods (Populus fremontii) in the floodplain of the Fremont River west of Hanksville glow magically in the last light of the evening. Photo Paul Smit. 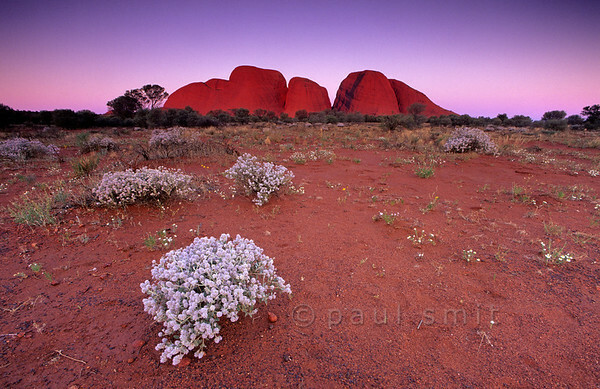 [AUSTRALIA.NTERRITORY 9856] 'Desert flowers near Kata Tjuta.' Kata Tjuta (The Olgas) is as spectacular as Uluru (Ayers Rock), 25 km to the east. Here it is seen at sunset. The white bushes are called Cotton Bush (Ptilotus obovatus). Photo Paul Smit. [GERMANY.THÜRINGEN 11021] 'Rainbow over the Thüringen plain.' A large part of the state of Thuringia (Thüringen) consists of rolling plains, called the Thüringer Becken. 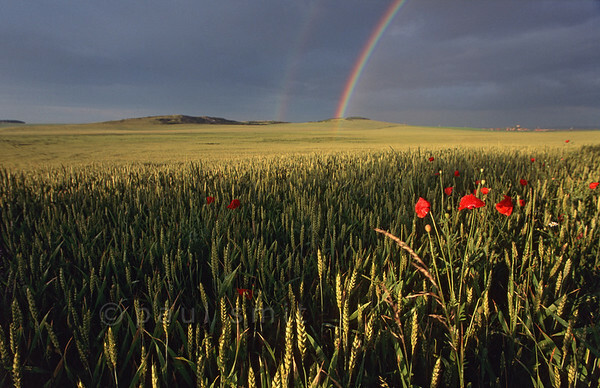 It is a country of wheat and poppies. Photo Paul Smit. [GREATBRITAIN.SCOTLAND 11022] 'Loch Clair near Torridon.' 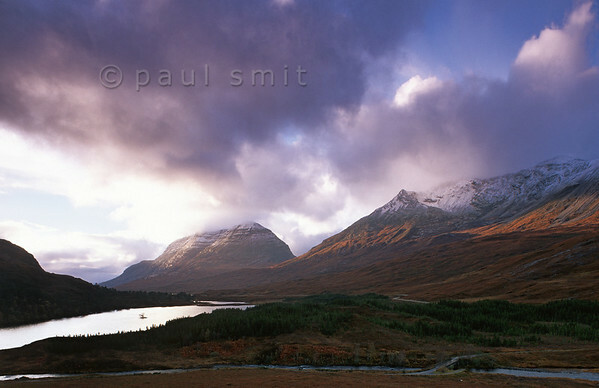 Wester Ross is one of the wildest regions of Scotland and known for its Torridon Mountains. Loch Clair is flanked by Liathach in the distance and Beinn Eighe at right. Photo Paul Smit.